Wild Child is a kid's salon, no doubt. They have all the bells and whistles to keep kids entertained and happy. Like what? Waiting Room: The waiting room has a dollhouse and a bunch of toys like dinosaurs, trains, fire engines, Barbie dolls, wands, and more. We generally have to go into the waiting room before and after our haircut to play. The Chairs: There are four haircut stations. There is a car, an airplane, a rocket, and one that is a normal chair with a highchair seat for younger kids. We've had three haircuts so far, and have sat in each of the vehicles. Television: At each haircut station they have a television with tons of shows for kids to watch if you so desire. Caleb's favorites have been there for him like Super Wings and Chuggington. Toys: There is also a draw at the haircut station where the stash a bunch of toys to pull out at a moments notice. Lolly Pops and/or Stickers: At the end of the haircut, if you'd like, they will give you kid a lollypop or a sticker. Of course, we need to discuss the cut itself. I had NO IDEA what to say for cutting a boy's hair. I'm a girl. I know girls, but boys I'm clueless sometimes. Crystal was our stylist and was great and guiding me through the decision. I knew I wanted to keep some of the baby cute curls but knew it needed cutting. She took that cue and was able to do a great cut and style for my little man. What stole my heart with the experience is that they had little bags where they gave me clippings of his hair as a memento of his first haircut. Bestill my mom heart. That's a keeper in his baby book! We started with Crystal and have stuck with her for all three haircuts so far. 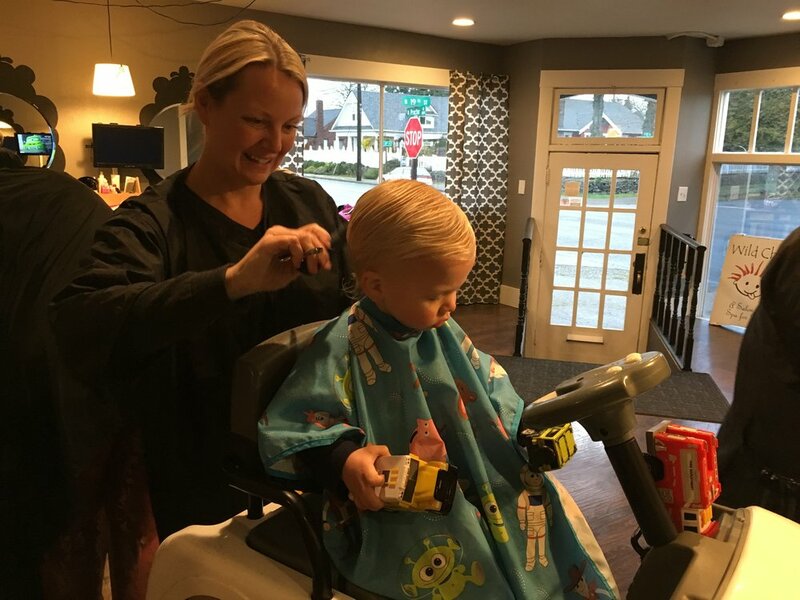 She is so wonderful with Caleb and does a great job with the cut and style. She has all the tricks down, too. For instance, she took a clip and put it on his apron (apron? is that what you'd call the thing they drape over you? hmm, sounds funny). This caused him to look down so she could trim the back of his neck. I can't speak of the other stylists, but I've met and chatted with a few while Crystal does Caleb's hair and they are all super sweet. For a 0-2-year-old, the cost is $21, then I gave a tip as well. Here are the services and cost list. A little pricey, but totally worth it for us. 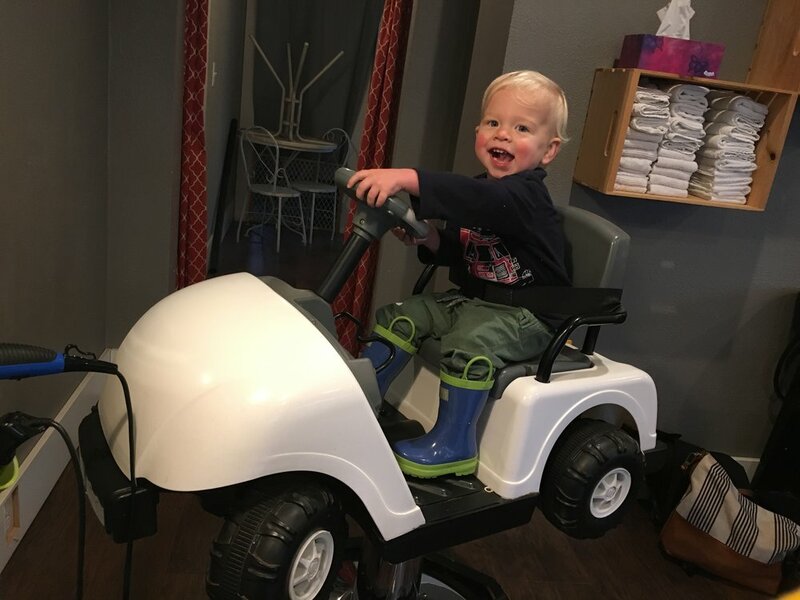 I've talked with other parents and most of them agree with having such a great experience with Wild Child and thinking the price is worth it (4.5 stars on Yelp, too). Only one of my mom friends seemed to have a less than stellar experience there, but she said it was probably her kid and not the salon. Also, I've heard of friends taking their kids to local barbers and having a great experience as well and being much cheaper. In the end, do whatever works best for you! I just wanted to share my happy experiences here. Where do you go for your kid's cuts?